The Rigging Company was back at it again, but this time enjoying a little slice of paradise. I have to say there are many great things about this line of work, but being able to travel to desirable locations to work on peoples yachts has to top the list. The Cayman Islands has no shortage of beautiful snorkeling, crystal clear water and also year round beautiful weather. However, despite this place being mostly water and boats, there doesn’t seem to be a plethora of boat services, especially rigging. The job was a Leopard Catamaran that was used for the charter business. The customer found us through the internet and was happy to hear that we travel abroad for our services. Jobs so far away are never easy, but with a little forethought, some critical planning, and whole lot of experience, almost anything is doable. It took a total of two trips to make sure we got it right, but in the end we managed to accomplish an entire re-fit or replacement of the standing rigging, some running and also some other items. The first trip required one technician to break down, the already un-stepped mast, lay-out measure and make a map of the standing rigging. Also, we assessed and advised on the rest of the mast and rigging. That’s when we discovered two things: make sure you bring back those special black plastic shroud covers, and those spreader ends do NOT look good. The shroud covers, as much as we dislike shroud coverings, are very important on catamarans due to the full battens which are many times made of an Aramid fiber like Kevlar (i’m guessing for strength over such a long length). Aramids chafe other fabrics, especially Dacron (polyester), very aggressively over time. Thus, these shroud covers prevent the upper stays from rubbing through the main sail when the sail is eased out and laying against the metal cables. The other item that we noticed was that the spreader end needed to be media blasted for further inspection. The corrosion had eaten it’s way well into the aluminum. So we decided to make and install new ends. Once we returned from our 1st trip, we could order parts and start making the new standing rigging. Rebecca Rusk, the shop Foreman, fabricated and finished the new spreader tips. We also dry built the new furler. 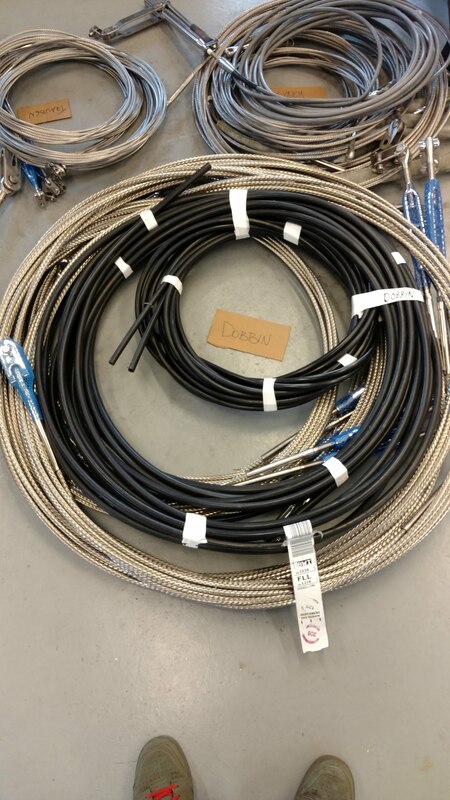 Once all of the rigging was made, spreaders repaired, and the new Harken headsail furler was dry built, we packaged everything and made it ready to ship. Once we received notice that the packages had arrived safe and sound. We arranged for two technicians to fly back down and begin our ‘work-ation’. Houston we’ve got a problem…The upper jaw toggles do not reach. After some careful measuring and consideration, we figured out the only way around this is to modify the Dumbo Ears (upper tangs). Thank god we brought a grinder, cut of wheels, and some files. TA-DA!!! It Still has Plenty of Meat. Once we overcame that hurdle, we pinned the rigging and the spreaders, and ensured everything was ready for the crane the next day. Step day was about a 12 hour work day, but we managed to make it all fit, tune it, pin it, tape it, finish some odds and ends. This left our final day on the island with some free time to conduct a sea trial and check out that everything was operational. Also we got to do my favorite thing in the whole world (well other than lunch of course), sailing and snorkeling in crystal clear blue water. Just talked with them on that at the Annapolis Boat Show at our tent, O13. Wow, 1-1/8″….that’s a big! Not sure we’ll ever see that on the Chesapeake Bay, but good to know know we have friends in The Biz when need to swage bigger than 5/8″.